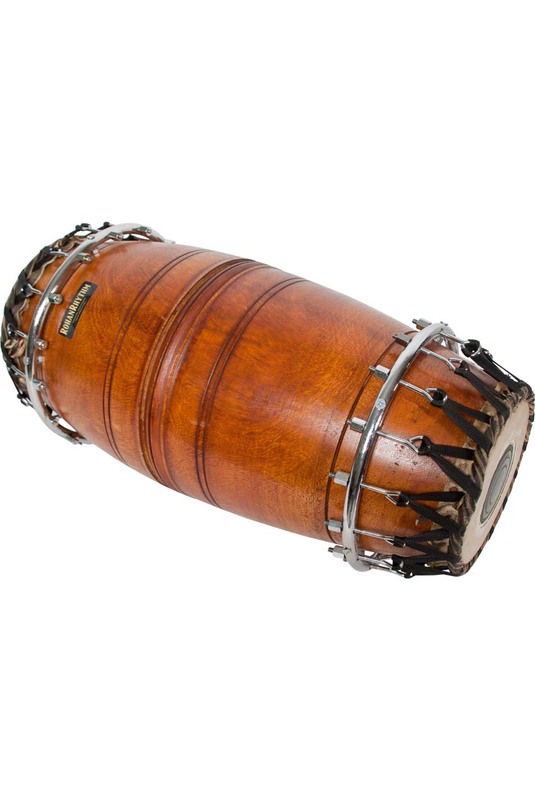 RohanRhythm 24 x 11 Inch Mridangam 2 Head High Pitch Jackwood Shell. The Mridangam is one of the most ancient and popular hand drums from India. It is the principal percussion instrument in South Indian classical Carnatic music. The mridangam has two drumheads: bass (thoppi) and pitched (valanthalai). Overall length is approximately 22-24 inches; the bass head is 7 1/2 - 8 3/4 inches in diameter and the pitched head is 6 1/4 - 7 1/2 inches in diameter. The shell is made of jackwood. It functions as a solo instrument, as well as the primary percussion instrument in vocal and instrumental ensembles. Sliver-thin reeds are inserted between the two layers of the pitched head to create a distinct, buzzed sound. When played, the drum is held horizontally, and played with the fingers and palms. For more information on the design, visit Rohan Krishnamurthys website.